Wonky is the fun-filled card game of building wobbly towers with odd-shaped blocks. Trip up your opponents as you stack a large block on a small one and make the tower wobble! Then watch your friends & family squirm as they place the next block. When it's your turn - reverse play for payback! Be the first player to get rid of all your cards without toppling the tower and you win! 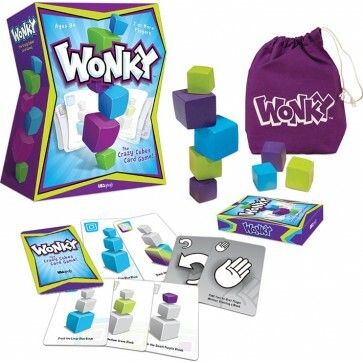 Wonky®: The Crazy Cubes Card Game makes a lot of family fun! Ages 8+/2+ players.